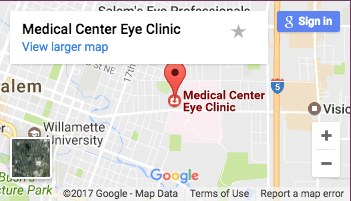 Medical Center Eye Clinic is conveniently located at 655 Medical Center Drive NE, approximately five minutes from downtown Salem and five minutes from the Market Street exit on I-5. There is free parking at the clinic. Please refer to the map for directions. If you have any questions, please call us at 503-581-5287. For appointments, please call us at 503-581-5287 or fill out the form below. Proceed to the emergency room at Salem Health or call us at 503-581-5287 for our on-call after hours ophthalmologist. The ophthalmologists in Salem share a call schedule. This means that an ophthalmologist is always readily available to you for emergency phone calls and to the emergency room staff for urgent care when needed. The quality of every patient's experience is so important to us that we want to hear from you. If you would like to give a shout-out of excellent service or are hoping to confidentially express a concern about your experience, please contact our clinic administrator by completing the form below. We'd love to hear from you about your experience. Please fill out the form below. How was your overall expereince? May we use your comments for our website, staff training, etc.? New Year’s day, Memorial day, Independence day, Labor day, Thanksgiving and the day after, and Christmas day.